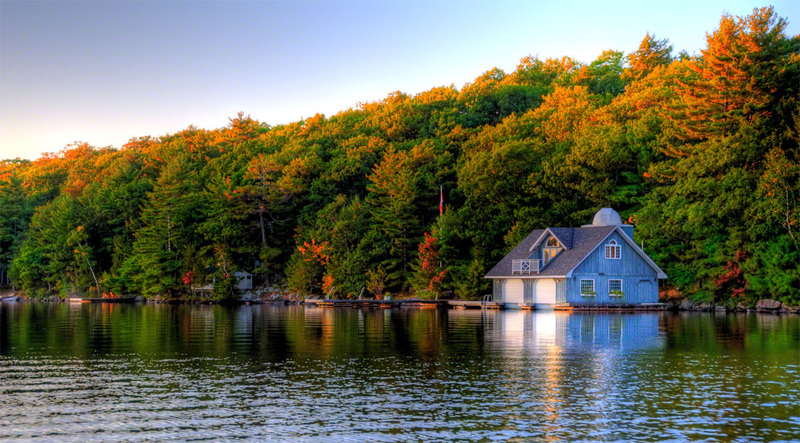 Lake Muskoka, the largest of cottage country’s many lakes, is also home to some of the most sought after and expensive Muskoka real estate (it’s also where you’ll find some of the most elegant luxury cottages for sale in Canada). If you’re looking to do a little research regarding top Luxury Muskoka cottages for sale – or even to check out some of the many exquisite cottage rentals that dot the shoreline – jump aboard the historic RMS Segwun, North America’s oldest still operating steamship, for a tour along spectacular Millionaire’s Row. Lake Muskoka also offers no end of great things to do, too, from top attractions to fall studio tours, endless boating and great fishing, as well as shopping in the key communities of Gravenhurst, Port Carling, and Bala. The lake is also home to a number of luxury resorts, the top Muskoka golf courses, and countless great restaurants in which to drink and dine.